If there were few candidates for position of this year Christmas pop-queen there's only one guy pretending to be Christmas schlager-king. Alright, alright, if we'll take a look at sales we'll see someone else who sold more copies of Christmas album but at least title of this Christmas schlager-prince belongs to Måns Zelmerlöw and no one else can't pretend! Few days before Christmas Måns was invited to Bingolotto to perform his two singles "December" and "Vit Som En Snö", second song was performed with Sonja Aldén - it wasn't the first time when audience could see them in duo as they use to perform this song in their Christmas tour and can you even suppose Sonja could sound bad in romantic ballad-duo? No! This woman is made to sing goosebumps ballads and this time she has also become perfect couple for Måns. Another Christmas appearance was delievered by Måns at Christmas concert on TV3 where he was singing "Tomten Jag Vill Ha En Riktig Jul" with child choir - very lovely performance that I also recommend to you. P.S. 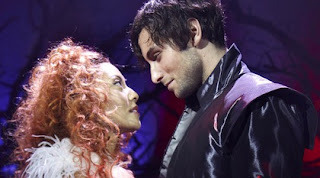 Picture above is taken from musical "Romeo och Julia". Funny? Hot? Weird? Whatcha think? Oh Damian, this is just what I needed today! Helping my Christmas last a little longer has helped me no end :) Thanks! I have a question.....I nticed that in Sweeden everyone sings or almoust everyone; and in the samte ime they are goood perfomers, some of them really amazing.Why's that, do you study a lot of music in school? Music export is a huge deal for country so Sweden pays special attention to music edication of young people - there are a lot of music schools and environment to create and record and so new and new talented artists get chances to appear, develop themselves and get into the spot.